Mount Rushmore, also known as the President’s Mountain, is located in the Black Hills in Keystone, South Dakota, United States. Mount Rushmore faces southeast so that it gets the most sun exposure. Mount Rushmore National Memorial is a sculpture carved into the granite face of Mount Rushmore. Approximately 3 million people visit the memorial each year. 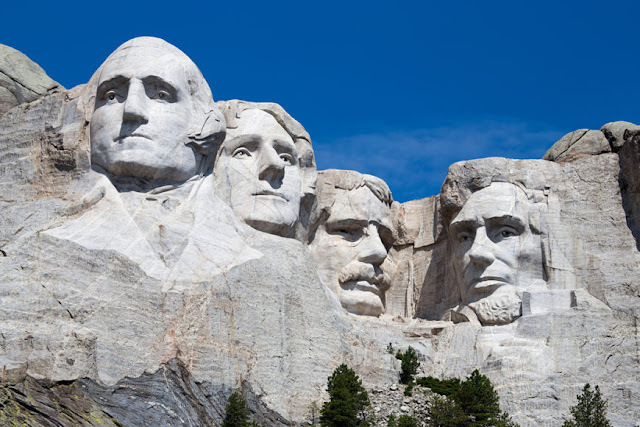 Sculpted by Danish-American Gutzon Borglum and his son, Lincoln Borglum, Mount Rushmore features 18-meter (60-foot) sculptures of the heads of four United States presidents: George Washington, Thomas Jefferson, Theodore Roosevelt and Abraham Lincoln. Originally Thomas Jefferson's head was carved to the right of George Washington, but because the granite was too weak, it had to be moved to the right. The first carving of Thomas Jefferson was removed with dynamite. • George Washington – He was the first president and represented the foundation of American democracy. • Thomas Jefferson – With the Louisiana Purchase, he greatly expanded the nation. He was also the author of the hugely influential Declaration of Independence. • Theodore Roosevelt – He not only represented the industrial development of the nation, but was also widely known for conservation efforts. • Abraham Lincoln – As the president during the US Civil War, he represents the preservation of the nation above all costs. Each of the president's heads is equal to a six-story high building. Their eyes are 11 feet wide; their mouths are 18 feet wide; and their noses are 20 feet long. The faces appear in the order: Washington, Jefferson, Roosevelt, Lincoln. If the carvings were life-sized, the presidents would be 465 feet tall. Originally Robinson wanted the faces of Buffalo Bill, Red Cloud and Lewis and Clark, but it was decided the president's faces would be better. They had to remove more than 800 million pounds of stone to create the memorial. Nobody died during the carving of Mount Rushmore but there were a few injuries. Mount Rushmore standing 1,745 meters (5,725 feet) above sea level was chosen due to its grand location, quality granite and because it faced southeast so enjoyed maximum exposure to the sun. It cost approximately 9.9 million to build/carve Mount Rushmore. The construction of Mount Rushmore National Memorial took 14 years, from 1927 to 1941. Over that time period, some 400 workers erected the sculpture under dangerous conditions, removing a total of 410,000 tonnes (450,000 US tons) of rock. Approximately one inch of the memorial will be lost due to erosion in 10,000 years. The carving of Mount Rushmore involved the use of dynamite, followed by the process of “honeycombing“, a process where workers drill holes close together, allowing small pieces to be removed by hand. 90% of the memorial was carved with strategically placed dynamite. The other 10% was completed with air hammers. The historian Doane Robinson first conceived the idea of carving the images of famous people into rock faces. The idea was supposed to help promote the region's tourism. The screenwriter Ernest Lehman tried to scale the faces but was not successful. He was in the process of writing Alfred Hitchcock's movie North by Northwest when he made his attempt. The movie features several shots of Mount Rushmore as well as a fight scene across the faces. Though it was arduous and dangerous work, no lives were lost during the completion of the carved heads. Mount Rushmore is also featured in the movies National Treasure: Book of Secrets, Team America: World Police, Mars Attacks! And many more. Each of the president’s heads is equal to a six-story high building. Their eyes are 3.3 meters (11 feet) wide; their mouths are (5.5 meters) 18 feet wide; and their noses are (6 meters) 20 feet long. It is sits at 5,745 feet above sea level. George Washington’s nose is longer than the others by about a foot. His measures 21 feet (6.3 meters), top to bottom. Theodore Roosevelt, the most controversial choice among the four Rushmore presidents, had died only eight years before the blasting began. Behind the sculpture of Abraham Lincoln, Gutzon Borglum envisioned a Hall of Records. It was completed more than 50 years after his death. sealed behind a 540-kilogram (1,200-pound) granite slab and tucked inside a wooden box are both original texts and copies of important American documents. The entire area covered by the memorial is 1,278.45 square acres. The faces of the former presidents Theodore Roosevelt, Abraham Lincoln, Thomas Jefferson and George Washington are depicted on Mount Rushmore. In 1937, a bill was introduced to Congress to add the image of women’s rights leader Susan B. Anthony to the mountain. Congress then passed a bill requiring only the heads that had already been started be completed. A massive panel with 8-foot-tall gilded letters commemorating famous territorial acquisitions of the U.S. was also originally intended. The work of the president's faces part of the sculpture began in 1934 and was finished in 1939. The whole project cost US $989,992.32. Maintenance of the Rushmore memorial requires annual monitoring and sealing of cracks, work that is undertaken by trained mountain climbers. Due to budget constraints, the memorial is not regularly cleaned to remove lichens. Approximately 2.5 centimeters (1 inch) of the memorial will be lost due to erosion in 10,000 years. Originally known to the Lakota Sioux as “The Six Grandfathers“, the mountain was renamed after Charles E. Rushmore, a prominent New York lawyer, during an expedition in 1885. Gutzon Borglum died in March of 1941. His son Lincoln continued to work on the memorial until October of 1941, when funding ran out. The ownership rights of Mount Rushmore have long been disputed. To resolved that dispute, in 1980 the Sioux Nation won a big court case against the federal government where they were awarded a $15.5 million settlement for the land, plus an annual 5% interest rate for the debt that wasn’t paid for over 100 years. The total figure added up to over $100 million years. The Native tribes rejected the offer of payment, requesting that the title deeds to the land be returned. That didn’t happen. The case still isn’t resolved, although some tribes have laid a claim to the nine figure offer. Visitor facilities have been added over the years, including a visitor center, the Lincoln Borglum Museum, and the Presidential Trail. The Grand View Terrace — one of the best places from which to see Mount Rushmore — is located just above the museum. The evening program and lighting ceremony at Mt. Rushmore National Memorial is offered seasonally from mid-May through September. Nearly three million people visit Mount Rushmore each year. The busiest months are June, July and August. May, September and October are less busy and popular months to visit as well. Mount Rushmore has become an iconic symbol of the United States, and has appeared in works of fiction, and has been discussed or depicted in other popular works. Mount Rushmore National Memorial was carved by Gutzon Borglum and his son Lincoln Borglum. It is often depicted as a cover for a secret location; shown with faces removed, modified, or added; or parodied. The memorial was also famously used as the location of the climactic chase scene in Alfred Hitchcock’s 1959 movie North by Northwest. Mount Rushmore once had an amateur baseball team.